There are dozens of amazing castles in the Czech Republic. The Czech Republic, one of our favorite countries, has some of the coolest castles in the entire world. And there are a LOT of them! Once upon a time, the land which we now know as the Czech Republic was ruled by a myriad of Bohemian monarchs, royal families, and nobles. These, shall we say, important folks were wealthy, powerful and showed little modesty when it came to their not so humble abodes. Opulence, beauty, and fortification were of the utmost importance, and as a direct result, over 1,200 medieval castles and chateaus have stood the test of time. What’s the difference between a chateau and a castle? We actually weren’t quite sure, so we asked around. As it turns out a castle is usually fortified and were used for defensive reasons, while a chateau was likely the opulent seat of nobility. A chateau doesn’t have high walls and ramparts like a castle would, but is usually far more decorative by nature. Nowadays, these grand reminders of the past are extremely well-preserved, accessible, and a vital part of the Czech tourism industry. 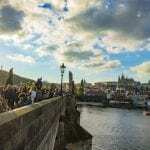 Each of these amazing locations can be visited as a day trip from Prague, or can be turned into a multi-day adventure. We HIGHLY recommend visiting at least a few of these awesome works of architecture during your time in the country; if not ALL of them. 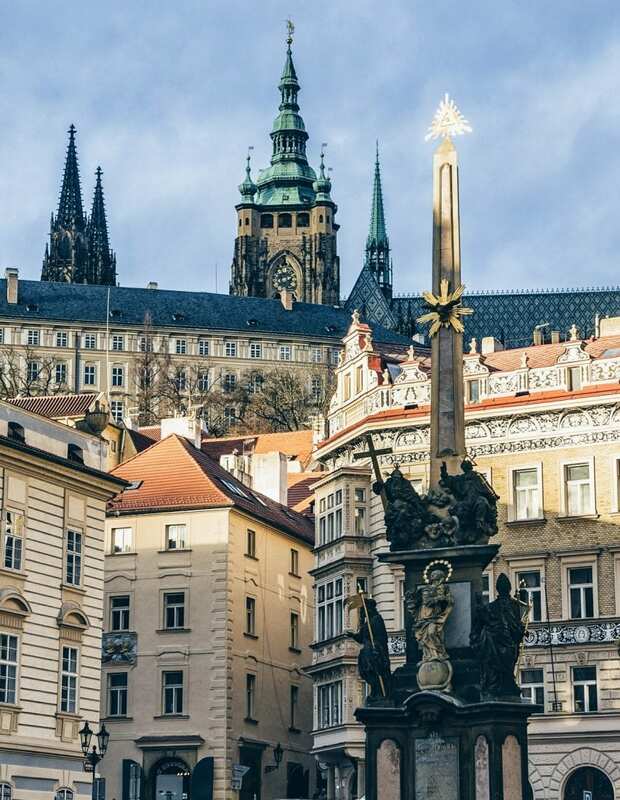 While there are certainly plenty of things to do in Prague we also recommend getting out of the gorgeous capital city and hitting the Czech countryside, to discover these castles and so much more! When you’re ready to believe in fairy tales again don’t miss these 12 amazing castles in the Czech Republic. All hail the mother of castles. Dating back to 870, Prague Castle (Pražský hrad) attracts 1.8 million visitors each year and is the largest ancient castle complex in the world. Once home to the most powerful Bohemian kings and Holy Roman Emperors, it currently serves as the official residence of the Czech president. This mega castle is also one of the 12 UNESCO World Heritage Sites in the Czech Republic. 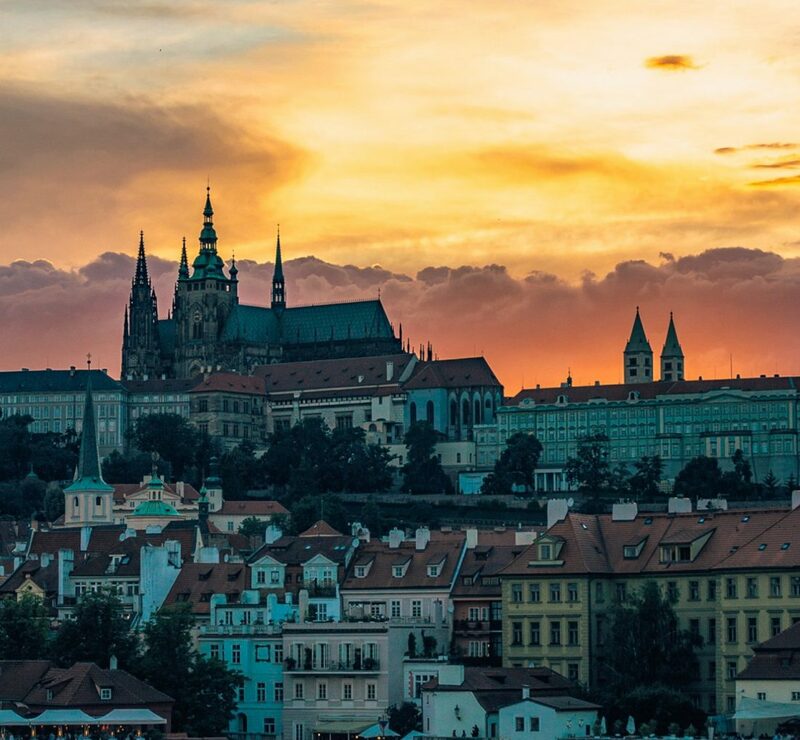 Comprised of a 12th-century monastery, basilica, lush gardens and lavish palaces, Prague Castle is a must see if you’re visiting the Czech capital. Its most recognizable feature is the Gothic St. Vitus Cathedral, which can be seen towering over Lesser Town (Malá Strana). How to Get to Prague Castle: Take tram 22 to stop Pražský hrad or Pohořelec and walk to the Castle’s Second Courtyard or Hradčanské square. Feeling ambitious? Take metro-line A to Malostranská and conquer the Old Castle Stairs. Twenty kilometers (12.5 miles) southwest of Prague lies one of the most amazing castles in the Czech Republic, Karlštejn. 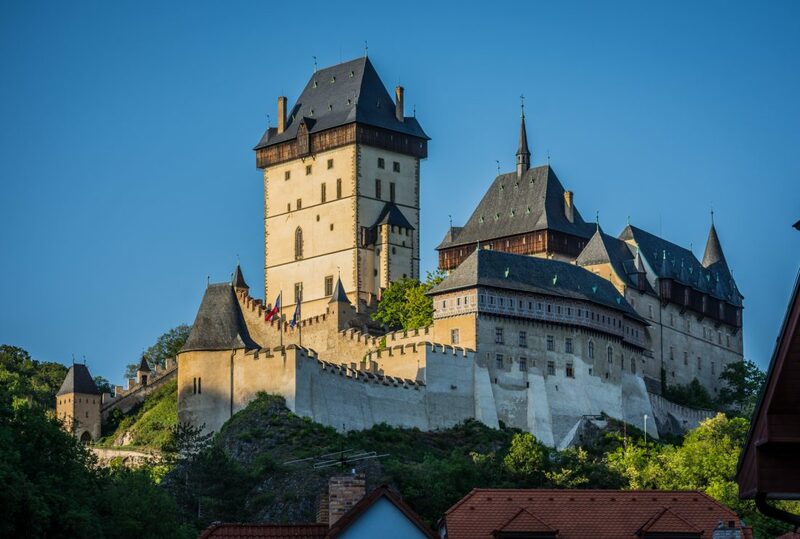 Situated high above the Berounka River, this 14th-century castle was founded by Holy Roman Emperor, Charles IV, to serve as his private residence and as a safe-house for his many royal treasures including the Imperial Crown Jewels. Nowadays Karlstejn Castle is one of the easiest and most popular day trips from Prague. A round trip visit to Karstejn from Prague can be done in four to five hours. Visitors can enjoy guided tours of the castle’s detailed interior, bask in beautiful views of the surrounding forests, and wander around the small medieval town of Karlštejn. How to Get to Karlštejn from Prague: The best way to travel from Prague to Karlštejn is by train. Regional trains leave regularly from either Prague Main Station (Praha hlavní nádrazí) or Smichov station (Smíchovské nádrazí) and the trip takes about 40 minutes. 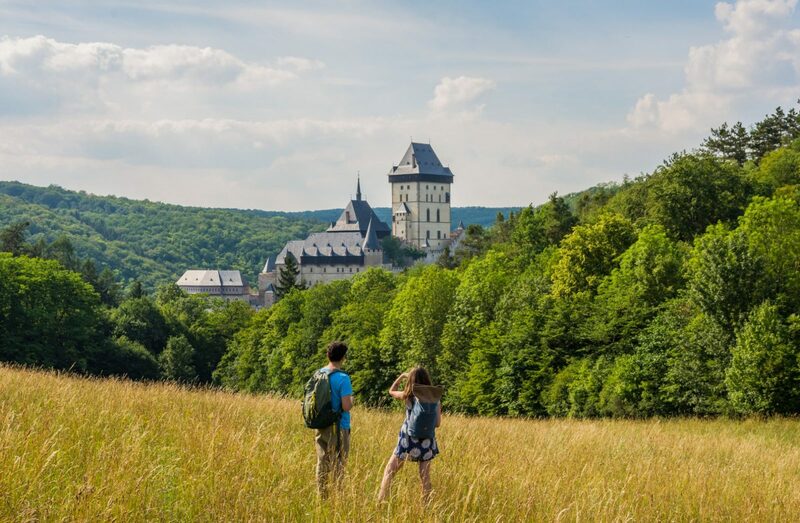 Once you arrive at Karlstejn train station, it’s a 20 to 30-minute hike uphill to the castle. Wear your walking shoes! Konopiště Castle is another one of those Czech places that looks like is came straight out of your favorite fairy tale. 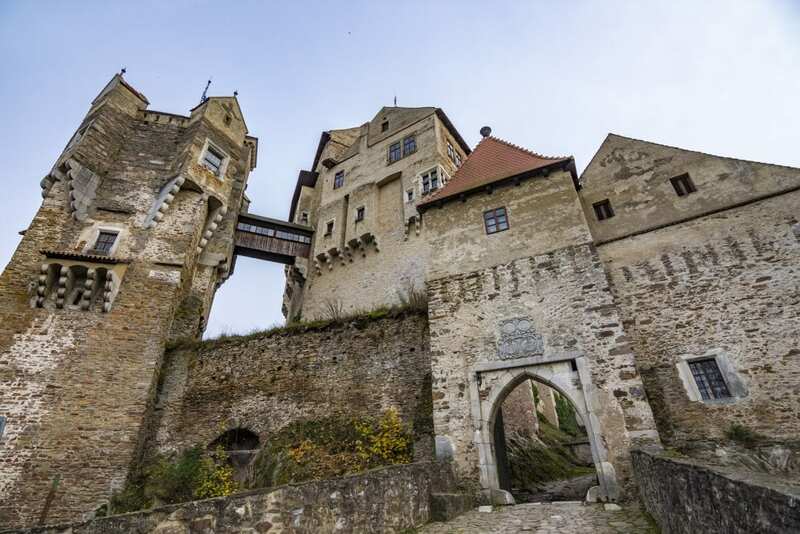 Complete with four cylindrical towers, a fortified watchtower and a drawbridge, the French-inspired fortress has reigned as one of Central Bohemia’s most amazing, and significant castles since the year 1294. Throughout history, Konopiště has been home to a long line of prominent, aristocratic families. Most famously, it was bought in 1887 by the Archduke of Austria, Franz Ferdinand d’Este. Today you can visit its pristine Rose Garden and choose from one of four castle tours which are included in the entrance fee. 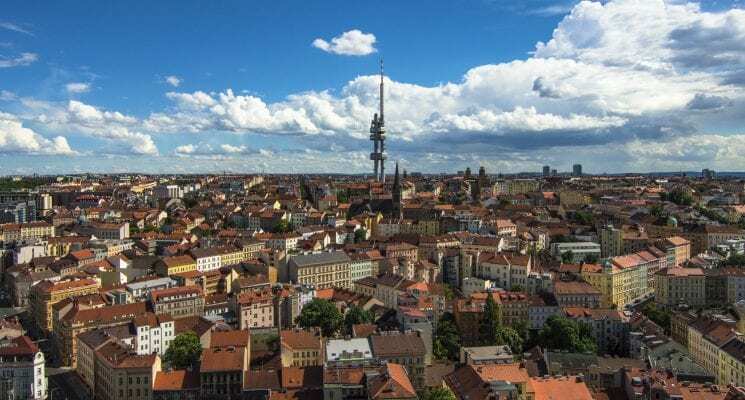 How to Get to Konopiště from Prague: The easiest way from Prague is to take a train from Prague Main Station (Praha hl.n.) or bus from Florenc terminal (ÚAN Florenc) to the town of Benešov. From there, you can either take a taxi to the castle or walk three kilometers (1.8 miles) along a marked touristic trail. At first glance, the perfectly preserved Pernštejn castle seems to defy the laws of gravity and time. Built on a rock above the village of Nedvědice, Pernštejn is a remarkable treasure from the late-Gothic period. It is often referred to as the “marble castle” due to marble-like stone which frames the doors and windows and used to be occupied by the richest, most powerful family in the Czech kingdom. Pernštejn castle is located about 50 kilometers (31 miles) from the Czech Republic’s second largest city, Brno, and is a popular destination among locals and visitors. How to Get to Pernštejn from Prague: The quickest and easiest way to get to Pernštejn is by car. For car rental options in the Czech Republic click here. It is possible to travel by train Prague Main Station (Praha hl.n. ), although it will require two transfers. First in Brno (Brno hl.n. ), and the second in Tisnov. The castle is a two kilometer-walk from the final stop in Nedvědice. If you’d like to extend your time in Moravia, we recommend spending a night in Brno and visiting Špilberk Castle, located in the city center. The first records of a castle along the Dyjí River can be traced back to the year 1100. Throughout the centuries, Vranov nad Dyjí Chateau has a long history of owners, development, war, and reconstruction. Vranov nad Dyjí is located about three kilometers (1.8 miles) north of the Austrian border and 22 kilometers (14 miles) from the historical city of Znojmo in the heart of Southern Moravia wine country. Today it stands as a living, breathing museum surrounded by incredible nature, which is part of Podyjí National Park. Guests can tour the chateaus immaculate interior and stroll through the manicured gardens. 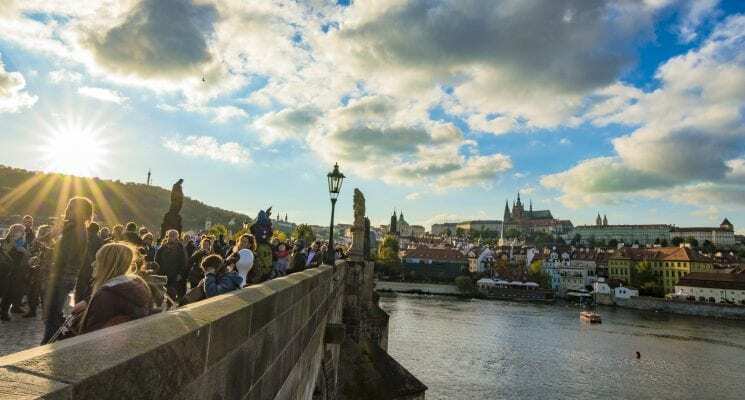 How to Get to Vranov nad Dyjí Chateau from Prague: From Prague, the best way to travel to Vranov nad Dyjí is by bus from Florenc terminal (ÚAN Florenc) or Prague Main Station (Praha hl.n.) to Znojmo. From Znojmo, you will take a city bus to Vranov nad Dyjí, Zámecký hotel and walk 14 minutes to the chateau. One way takes approximately five hours, so we recommend spending an evening in Znojmo drinking local wine and enjoying Znojmo Castle. Not far from the Moravian city of Olomouc, stands the romantic, 14th-century Bouzov Castle. Once home to Teutonic Knights, this medieval complex is a popular film site for Czech fairy tales as well as the Italian series, Fantaghirò. Today, children can receive their very own ‘Knight Certificate’ after exploring the life-size exhibition of Dragons and Dragon Slayers in the castle’s cellars. Visitors can also enjoy The Castle Armoury, Neo-Gothic chapel and two functional drawbridges. How to Get to Bouzov Castle from Prague: Regional trains leave from Prague Main Station (Praha hl.n.) to Mohelnice approximately every three hours. 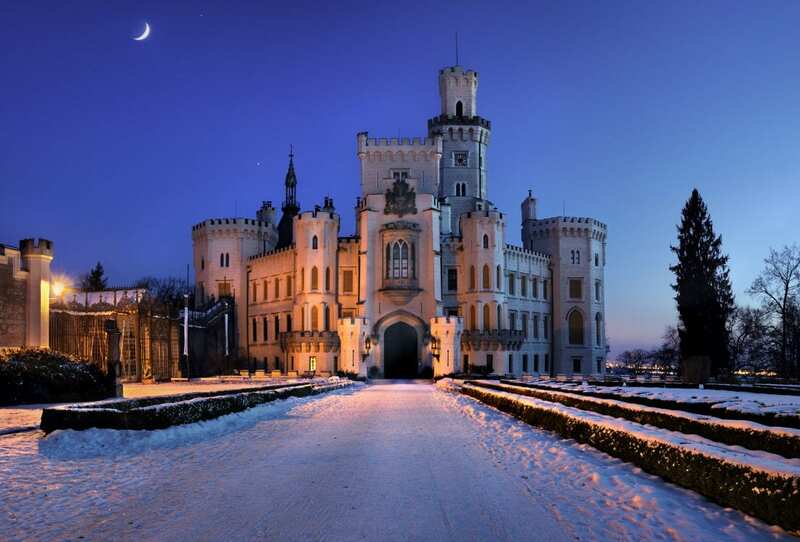 From Mohelnice, you can take a taxi 17 kilometers (10.5 miles) to Bouzov Castle. 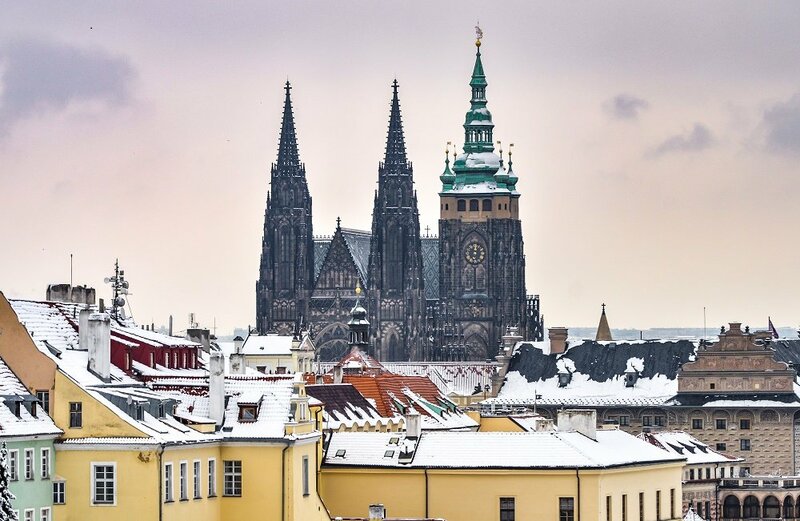 We also recommend spending an evening in Olomouc and checking out the Holy Trinity Column, Gothic St. Wenceslas Cathedral and the Romanesque Bishop’s Palace. Loket is a 12th-century, stone castle surrounded on three sides by the Ohře River. It is located 12 kilometers (7.5 miles) from the gorgeous spa town of Karlovy Vary in western Bohemia. Due to its thick defense walls, it was once referred to as “The Impregnable Castle of Bohemia”. Nowadays, Loket Castle is admired for its Gothic style, rich history, and unique location. Inside, guests can view extensive displays of porcelain, Gothic murals, and historical military weapons. They may also, at their own risk, explore the Chamber of Torture, which is set up in the castle’s authentic basement prison. It comes complete with moving figurines and audio. How to Get to Loket from Prague: From Prague, you can take a direct bus from Florenc terminal (ÚAN Florenc) to Loket. Buses operate every day and depart once daily. The journey takes about three hours. 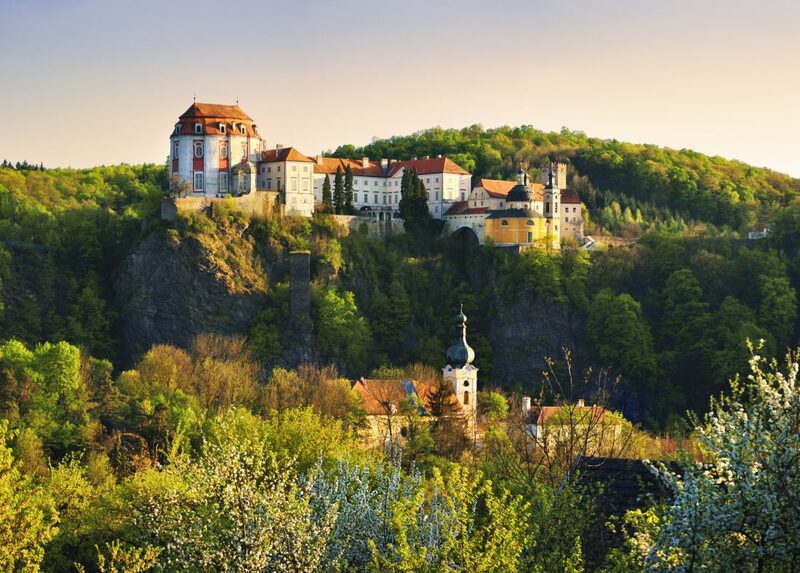 We recommend visiting Loket Castle combined with a day-trip or overnight in the nearby spa town, Karlovy Vary. Trosky Castle is one of the most well-recognized landmarks of Bohemian Paradise (Český ráj). Ruins of the gothic 14th-century castle rest eerily on the summit of two volcanic vents. During the Thirty Years’ War, Trosky was burned to the ground by the Imperial Army and abandoned. In the 19th century, the castle underwent a series of repairs. Visitors can now climb to the top of the lower peak, Baba (Old Woman), and an outlook tower under the higher outcrop, Panna (Virgin). How to Get to Trosky Castle from Prague: You can take a train from Prague Main Station (Praha hl.n.) to stops Borek pod Troskami or Ktová. 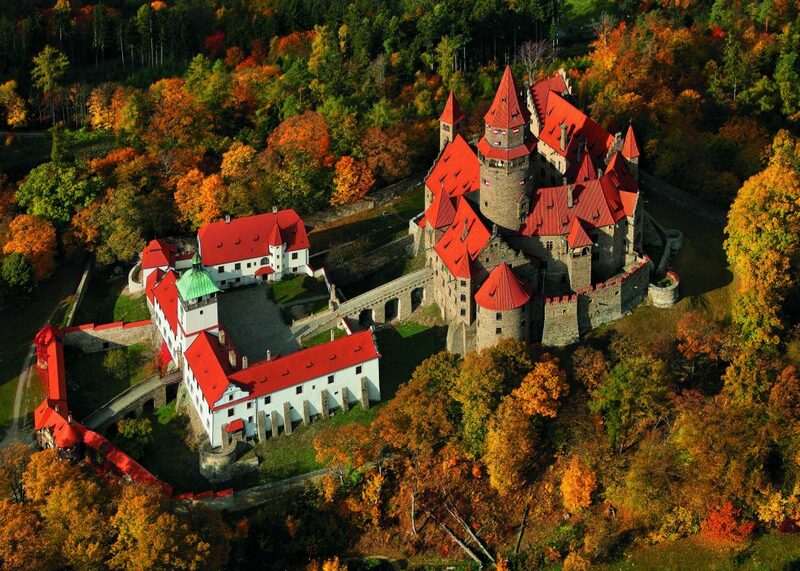 From either stop, it is approximately three kilometers (1.8 miles) on foot to Trosky Castle. If that is too far, a bus also runs from Borek pod Troskami to Tachov or Troskovice. 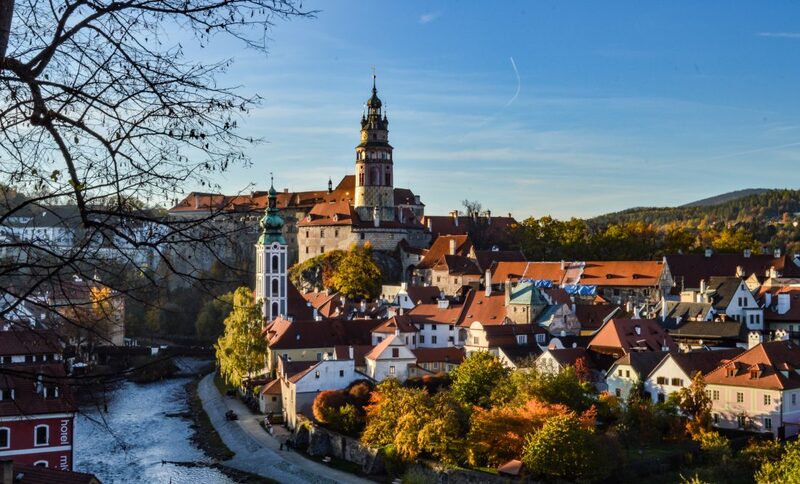 Český Krumlov’s UNESCO-protected historical center is the epitome of a fairy tale. Its cobblestone streets and quaint houses center around the stunning and massive Český Krumlov Castle. Dating back to the year 1240, the castle was built by the Witigonen family, who were the main branch of the powerful Rosenberg family. Today it’s revered for its architecture, influence, and preservation which includes the world’s most completely preserved Baroque theaters. Visitors can enjoy panoramic views of the town from the castle walls and walk through the enormous castle park. 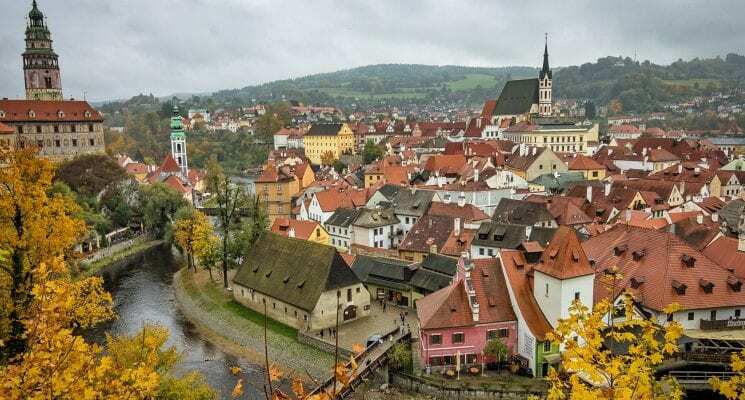 Visiting Cesky Krumlov on a day trip from Prague is a very popular tourist activity so you should expect to encounter a high amount of travelers, especially in high season. 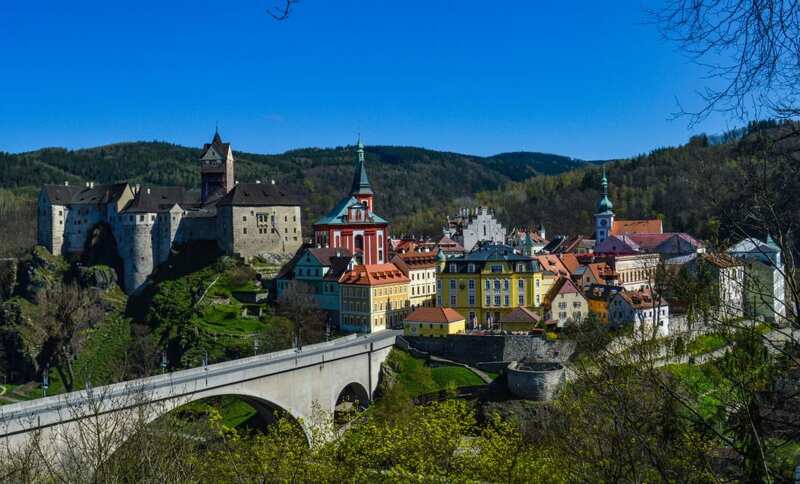 How to Get to Český Krumlov from Prague: There are quite a few options for getting to Český Krumlov. Buses leave regularly from Florenc terminal (ÚAN Florenc) and Prague Main Station (Praha hl.n.) directly to Český Krumlov. You can also take a direct train from Prague Main Station (Praha hl.n.). 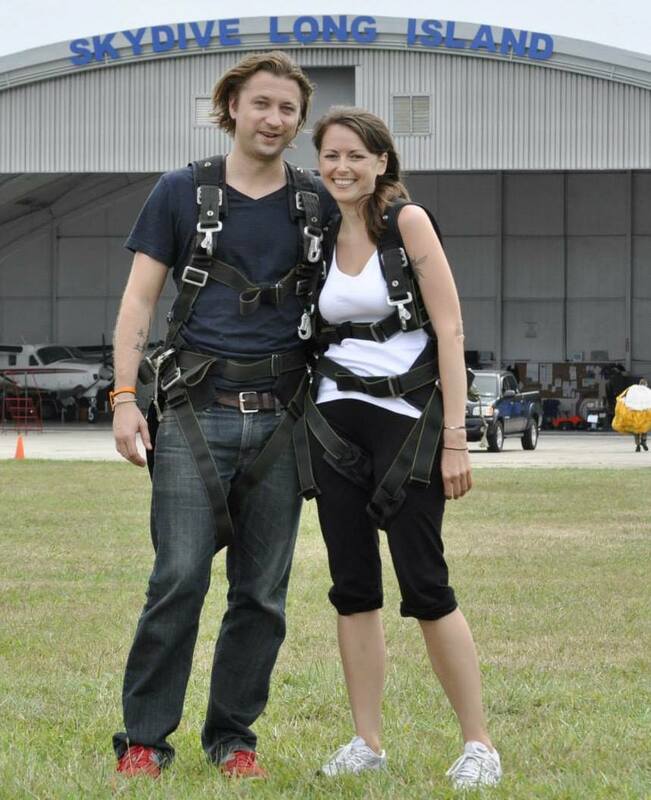 The trip typically takes about three and a half hours. Český Šternberk, or Sternberg in German, translates as “Star Mountain”. This gothic style castle was built along the Sázava River during the mid-13th century and has remarkably been owned by the same family for almost 800 years. The current owner, Zdeněk Sternberg, still lives there. One of its most prominent features is a projecting bastion called the Dungeon. 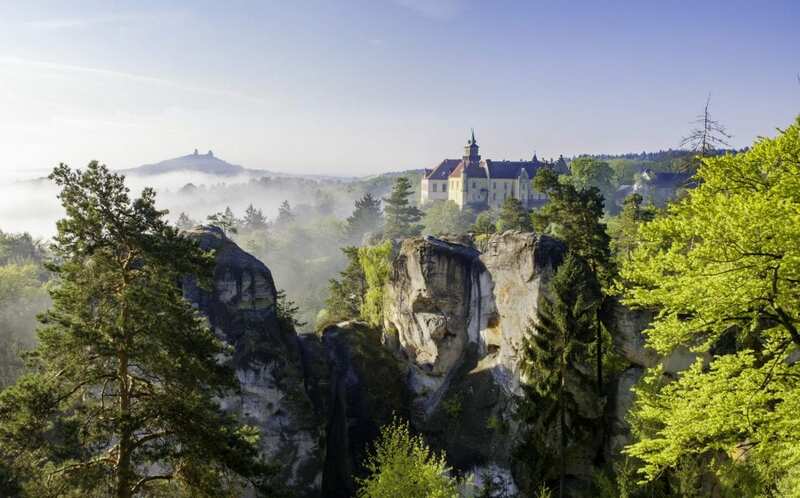 Today Cesky Sternberk serves as a lookout point over the Bohemian countryside. Inside the castle, visitors can tour 15 grandiose rooms each furnished in the style of a different historical period. How to Get to Český Šternberk Castle from Prague: From Prague, take a train from Prague Main Station (Praha hl.n.) and transfer via Cercany to the town of Český Šternberk. From the station, it is about two kilometers (1.2 miles) on foot to the castle. 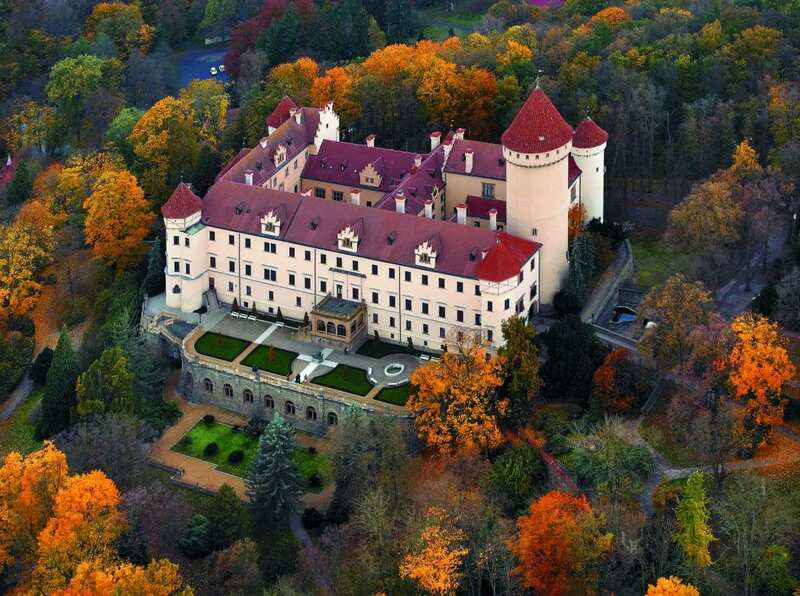 Hluboka nad Vltavou is one of the most beautiful and romantic castles in the Czech Republic. Situated in the town of Hluboka nad Vltavou in South Bohemia, it was originally built as a Gothic castle during the 13th century. Throughout the next several hundred years, it was expanded and rebuilt until ultimately reaching its current Tudor-style reminiscent of England’s Windsor Palace. Guests can tour the castle’s beautiful interior filled with original furnishings relax in the extensive surrounding gardens. 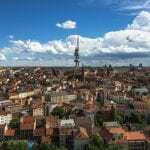 How to Get to Hluboka nad Vltavou from Prague: The best way to travel from Prague to Hluboka nad Vltavou is by bus from Florenc terminal (ÚAN Florenc) and Prague Main Station (Praha hl.n.) Both will take you to Budweis station in the town of České Budějovice where you will need a local bus or taxi to get to Hluboka nad Vltavou. In the foothills of the Šumava mountains, are the crumbling ancient ruins of Rabi Castle. It is the largest castle in the Czech Republic and sprawls across the top of a prominent hill near the Otava River. Despite surviving some of history’s most turbulent periods, Rabi was severely destroyed during the Thirty Years’ War and ordered not to be repaired. Over time, it became a graveyard of stone and resources for the local villagers. Today, visitors can climb a massive tower with spectacular views of the countryside, tour the Holy Trinity Church, Jewish Cemetery and explore the small, picturesque town of Rabi. The best way to reach Rabi Castle from Prague is by car. For car rental options in the Czech Republic click here. It is possible to combine a road trip to Rabi with nearby castles, Kasperk and Velhartice, as well as Šumava National Park. We recommend spending a night in the charming town of Sušice.